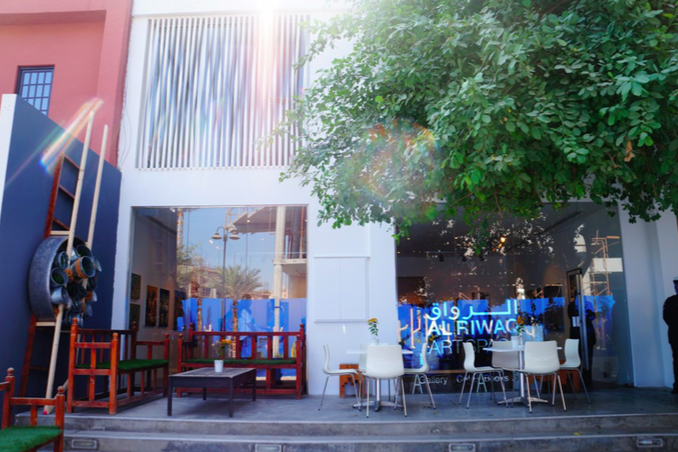 I am a regular visitor to Al Riwaq Art Space in Bahrain. This is where I met Errin Stone, the focus of my blog today. He was managing the café at the Gallery. He is a big man with a big personality and a passion for life and so we got talking about his dreams. Fast forward a couple of years and I am doing some coaching with Errin. He has a vision to be a star in the food world and he certainly has the personality and presence to do this. 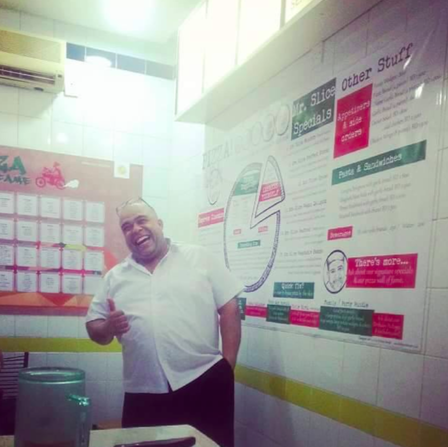 He lit up when he talked about having his own Pizza restaurant and, low and behold, I see his Facebook status popping up in my newsfeed: he has started a Pizza restaurant. I like Errin and I like pizza, so I head down to see the restaurant. It is in an alley off a main road, a small place with a table, a small kitchen and a delivery bike – and of course Errin with a very big smile on his face. This is more than just Pizzas; it is a meeting place for the community. In this tiny place you see groups of people talking, laughing and, most of all, eating really good pizza. People post their group selfies and tell others to get down to Pizza Empress – it really is the place to be! When I met Errin a couple of days ago, I realised that Pizza Empress is not going to be the final destination for his dream to come true, but I will let Errin tell the story. My passion is the feeling of excitement when I am able to serve people food. Especially pizza! I do not make pizza – I create pizza!! Each one is a new creation for the customer. I like to make it personal first by talking and then discovering the likes and dislikes of toppings and other details. Then I try to understand the mood of the customer (happy, in a rush, talkative, reserved, playful, or serious). Then I head off to create the pizza (to share my love and energy). Pizzas are works of art – the same but different every time. I discovered this when I was very young, around 8 or 9, having to make a lot of my own food and working in child care institution as part of my daily chores. I remember times when I was making my mother’s coffee; she told me what she wanted and I was able to create the taste of her desire without even knowing what the taste was suppose to be like. She would say “Errin you make a great coffee” and that made me feel great. When I was in various foster homes I prepared daily meals for the others, and I loved feeling that I was helping. When I was working in restaurants as a dishwasher and salad maker, preparing food really mattered. It felt good to get the order right and have the feedback of satisfied customers. Not only good feedback but also bad feedback; it develops skills, good taste judgment, portion control, and taught me to listen to customer orders very carefully. My purpose is for my customers to enjoy me building their taste sensation. Cooking great food, with love, for other people. I also love the entertainment part of my work; The restaurant is my Stage, hosting and cooking is a performance and I have fun when I create this experience with my customers. How do you know this is your purpose? It makes me excited and comfortable and for the most part I find it comes naturally to produce food and manage the process, especially when I work closely with each customer and they can be a part of the whole experience. How does it feel to have combined your passion with your purpose? The result of combining passion with purpose is the fuel for my fire. It keeps me showing up each day. To have a passion that links me to people energises me. No matter what the hurdle is I am able to keep finding solutions by looking beyond the problems. I overcome challenges whenever they are there. This is rewarding and feeds my survival instinct. This drives me on, time and time again. How does it feel to do what you love? I feel contentment. I have the freedom to direct my daily efforts and to know that the service I provide is generally a good experience for people. The under achiever triumphs!! H​e only got a Slice Not the whole pie! !​T​he Survivor’s story!! Challenges:​ D​oing more for others than for myself: this is part of my life story and sometimes it is not helpful to my business. I am not a good negotiator for myself. I am a good worker and a leader but a bad businessman. Finding the right people to work with: I am trusting and sometimes I get let down. Right now I am facing a lot of challenges: the business I am working within is not working out as well as I had hoped, my business partner and I see things very differently. It is not a never again moment because I am learning. The main thing I have learned is where my ‘line’ is. I need to move on and find a more productive partnership, and I am confident that this will happen even though I don’t know exactly how at the moment. 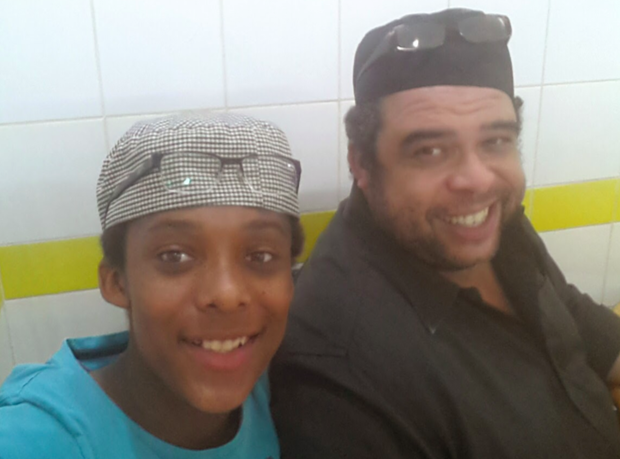 Joy:​ To have been able to share my experience of my Bahrain life with my son. I hope I have demonstrated some important lessons about the keys to success through our journey together. He has seen me survive and thrive – there have been very tough times and he has seen how to manage good and bad times. Hard to say – I believe that everything happens for a reason. I have no regrets. But if I could have one wish come true, in the words of the song “​I wanna be a millionaire….. So f****ing bad”!!!!! Just for a day​hehehehe. Let’s see, perhaps I can make it on the TV or write a great book…..
What do you want to be known/famous for? Leaving a positive legacy for my son. For him to feel proud of this legacy and to prosper mentally, physically and financially, but mainly just to live a happy healthy family life. ​Well in my own world I am already famous hahahahahahaha. Let us see when the song is over how the story is told. The expectation of my customers keeps me motivated to return to work every day. I know that keeping on track is how I will be able to provide for my son and demonstrate the power of keeping at something – however many challenges there are. Always remember that life is a roller coaster preparing you for the next corner or hill to climb. There is no fast track to discovery of passion or purpose. Notice if a desire inside you keeps you awake at night follow it and then maybe you will find the light of happiness in whatever you choose to do. In the bad find the good and in all problems look until you find the solution – it i​s there. Life is a stage, for better or for worse it’s y​our​ life, so make sure you enjoy it.